Re-designing the TeamBuilders website was an incredible challenge that we were entrusted with by the dynamic duo of Shannon & Lorraine Freedle who own the practice. TeamBuilders was founded in 1995 in response to a community's need for individualized, behavioral healthcare services for its children, families, and organizations. They have since evolved to serve many New Mexico families with numerous locations in the State. This site was challenging because it needed to accomplish three major goals. First it had to market the services of TeamBuilders and its subsidiary clinics in multiple locations throughout New Mexico. 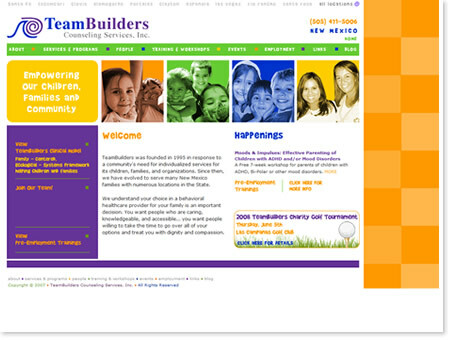 Secondly, it needed to server as an information hub for clients, clinicians, and associated partners in all of the communities Teambuilders serves. Thirdly, the site needed to operate as recruiting and retention vehicle for the large staff of behavioral healthcare professionals and support staff that make this organization function at such high levels. Through a lot of meetings, concise organization of content, and a clear understanding of the Freedles’ vision of the organization, we created a site that is useful and dynamic.